A visit to Apalachicola is a delightful trip back in time with more than 250 places on the National Register of Historic Places. Recently it has become a favorite for artists, theatre goers and visitors looking for a taste of Old Florida. The waters of the Apalachicola Bay are among the cleanest and most productive in the nation yielding the most delectable oysters and seafood in the world. Activities revolve around the natural environment, pristine beaches, miles of fresh water rivers, marshes and salt water bays which provide endless opportunities for the outdoor enthusiast. Fishing, kayaking, boating, birding, star gazing, hiking and biking are among our visitor's favorite activities. Numerous special events are held throughout the year, including the Florida Seafood Festival in early November, The Apalachicola Art Walk in March, Annual Spring Tour of Historic Homes and Plein Air Painters in May. 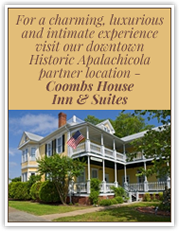 For more information on each of these activities and a copy of the Forgotten Coast Visitors Guide, click here for the Apalachicola Chamber of Commerce.